At these, modern times, there are many different specialties that a person can choose to learn and specialize in if he or she wants to build a stable career. It is widely accepted that the IT field is one of the best areas to turn to – every single day, the need for technologically-inclined professionals is increasing. Since there are many different areas that you could choose to start learning, it might be confusing as to which ones are worth it, and which ones are… Well, not so much. That being said, it is widely agreed upon that computer engineers are always on the top of the list – both career opportunity and salary-wise. 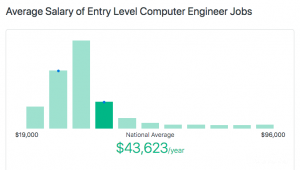 If you want to learn about the computer engineer salary, read on – this article is for you! At first, we’ll briefly cover the profession itself. You can look at it as a short and sweet job description – I’ll give you a very simple and to-the-point introduction and explain what the job entails. Before we start talking actual numbers, we’ll also have to cover the main types of computer engineers that are out there. Why? Simply because they have very different salaries, and it’s beneficial to know all of them! It’s important that you know what a computer engineer actually does in their day-to-day lives before we start talking about the average computer engineer salary. Why is this important? Well, it’s pretty easy to throw out numbers left and right. However, without proper context, those numbers don’t really mean anything, now do they? Furthermore, often times you might think that a computer engineer has to do only *this* and *that*, but in reality, the job description might include many more responsibilities. There are two types of computer engineers out there, although both of them somewhat overlap. The first type of computer engineers is concerned with hardware – that’s pretty self-explanatory, isn’t it? We won’t be going too in-depth with this type, however, since this article revolves around the second type of these experts – the ones that deal with software and networking. Just for reference’s sake, when I use the term “computer engineers” in the rest of this article, I will be talking about these latter engineers, unless specified otherwise. Computer engineers are mostly concerned with finding, identifying and solving possible network issues, developing apps and offering technical support to the rest of the team. They are the people that take care of and manage everything related to these topics in a team-based environment. So, even though it’s a very small amount of some basic information, you can now probably imagine the extent of a computer engineer’s responsibilities. All of that being said, we still need to talk about the different types of computer engineers before we answer the question – “how much do computer engineers make?”. As a general rule, different job titles have multiple different tags that can be attached to them. This, by any means, isn’t groundbreaking information. Still, it’s something that people often tend to forget or disregard. That shouldn’t be the case! Depending on your job sub-title, you’ll receive different tasks, your employers will expect different results and, naturally, you’ll be able to expect a different salary. When talking about the computer engineer salary, this is no different. There are many different tags that you might get assigned to your job title. Most of them depend on your experience in the field, knowledge of the subject, past workplaces, and so on. That being said, even though the tags usually depend on the job in question, there are a few that have been universally accepted, and can be applied to most of the job positions out there. In this “computer engineer salary” article, I will be using three of the main job tags that a person might get once he or she starts working as a computer engineer. The three main tags are entry-level (otherwise known as beginner), junior and senior. You may or may not have noticed, but these tags are the most common ones that are used in describing a person’s skill level in a field – this is especially true when it comes to IT-related fields. Even though I won’t go too in-depth with each of these groups of computer engineers, it’s still really important that I talk about them. Why, you might ask? Well, you have to know the requirements of each of the groups so that you could better understand why they are getting paid the computer engineering salary that they are. So, without further ado, let’s not stall this any longer and jump into the very first group – the beginner computer engineers. The entry-level (or better known as “beginner”) job tag is one that is used with the absolute newcomers of the industry. Beginner computer engineers are usually (but not always) very young people that are still studying to get their computer science degree, and are already looking for a place to start applying their skills in practice. This group of people can also have a large number of beginner computer engineers who have acquired their skills through some alternative means. For example, since this specialty is so popular (and that’s not only because of the computer engineer salary) and traditional education is so expensive, many people turn to online courses, tutors, YouTube videos and articles. You might think that these methods may be ineffective, but many people actually consider this to be the future of education. It shows a person’s motivation and dedication, since studying and learning something by yourself (even if it’s because of the computer engineer salary) is much, much harder than “being inclined” to do so by a learning institution. Whatever the case might be, entry-level computer engineers have their work cut out for them. The very first thing that they have to do is prove themselves in the industry – and that’s the hardest part! Since many beginners are prone to quitting and turning to some other field of expertise, employers tend to be somewhat judgemental and weary when it comes to hiring such people. Industry newcomers have to work exceptionally hard to both prove their motivations and to earn their place in this line of work, as well. Things might be a bit more lenient, but the facts speak for themselves – the competition in this area of work is huge, and there are multiple people trying to get the same spot in a company. Employers know that, and act accordingly. As per usual, the junior group tends to be the biggest and most complicated out of the three. This computer engineer salary article is no exception – and let me tell you why. Junior computer engineers are the “middle child” of the industry. Beginners have the opportunity to reach the junior level, while junior engineers themselves can eventually become seniors. Naturally, as you would expect, there’s a lot of overlap. But why does this make things difficult when we’re talking about the computer engineer salary? If you’re wondering how much do computer engineers make, you should know that the average computer engineer salary is very… Well, inconsistent. It might seem logical to think that the junior group would be a great representation of the average, but this is very wrong. As I’ve already mentioned, you’ll notice a lot of overlap between the junior group and the other ones. At any given point in time, the group might consist of either more entry-level engineers, or almost-senior ones. This, naturally, will affect the average computer engineer salary a lot. Just something to keep in mind! Job description-wise, junior computer engineers are usually people who have already got some experience in the field of engineering. They already know the main points of what they’re doing, and can start working on their own, without constant supervision. Furthermore, junior computer engineers usually receive more interesting and unique tasks when compared to their younger, entry-level colleagues. This can both boost motivation and allow the engineers to further their knowledge and experience in the field. Senior computer engineers are the most skilled people in the field of computer engineering. They have spent the majority of their lives working on and developing their skills, and are commonly considered to be irreplaceable members of a team. This is because senior engineers often work in the same company for many years at a time. Task-wise, these experts deal with the toughest and most challenging assignments that there are. This is only natural, though, since they do have the most skill and knowledge to deal with challenging tasks. Furthermore, many computer engineers work as mentors to their newbie colleagues. This is a very common phenomenon in most jobs out there – senior employees pass on their knowledge and information to the company newcomers so that they could go through the entry process more quickly and smoothly. When it comes to the senior computer engineer salary, I probably don’t even need to tell you that these professionals make the most amount of money out of all three of the groups (duh). Once we start talking numbers, however, you will see just how significant the difference is. It makes sense, though – if you’re working on the toughest tasks out there, and have a ton of other responsibilities on your shoulders, you should be compensated accordingly. And I’m not even mentioning the fact that these people have put in years and years of work into their profession! Now that you have a huge amount of context and additional information about the computer engineer salary, profession and everything that surrounds it, we can finally start talking about the salaries themselves. For comparison, I will be using the average US salary (around $3700 USD per month as of writing this). Also, do keep in mind that these numbers are just estimates, and are not a factual computer engineering salary! The entry-level salary is often referenced when people want to emphasize the fact that even complete computer engineering beginners can make a decent living out of their skills. Whether that’s true or not, let’s find out. 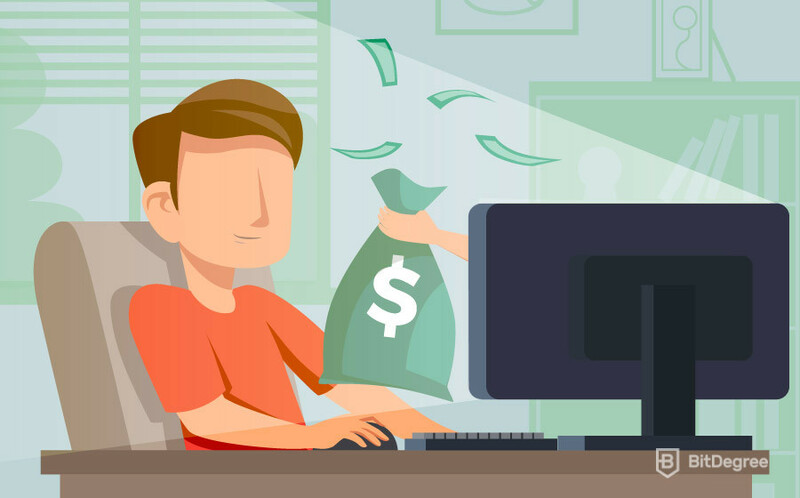 According to Ziprecruiter.com, the average entry-level computer engineer salary comes out to be around $43,600 USD annually, or $3600 USD per month. Honestly, this computer engineer salary makes perfect sense! It’s just around a hundred dollars less than that of the average salary in the US, but with the amount of learning and studying that is required, it’s fair game! 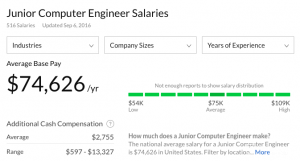 Even though the junior computer engineer salary is really difficult to estimate, Glassdoor.com still provides us with a number. According to the website, junior computer engineers should make around $74,600 USD annually, or almost $6220 USD per month. Keeping everything in mind, that turns out to be a pretty good and balanced computer engineer salary. It’s still far from a dream one, but that’s where senior computer engineers come in. The senior computer engineer salary is often regarded as something that makes all of the hard work that people put in computer engineering worth it. Let’s see if that’s really the case. 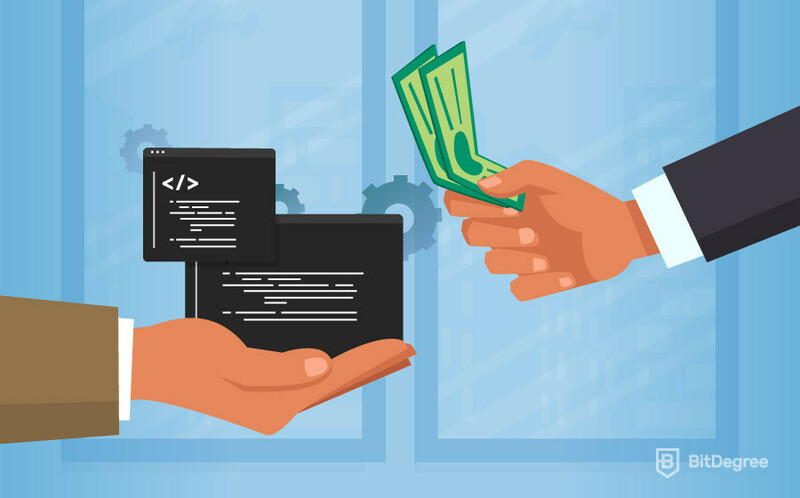 According to Payscale.com, the senior computer engineer salary turns out to be almost $125,000 USD per year, or more than $10,400 USD per month! Truth be told, that is an impressive salary! If you’re wondering whether or not it’s worth putting in the hard work and becoming a computer engineer, this salary should definitely sway your opinion towards a positive answer! Well, now you know all about the computer engineer salary. I hope that you didn’t only learn how much do computer engineers make, but also a bit about the profession, in general, and about the main types of computer engineers that there are. Computer engineering is a really difficult field to get into, but if you’re passionate about what you do, it’s definitely one that’s worth studying and learning about. If you do decide that the computer engineering salary is for you, I wish you the best of luck in your future career path!